It is a very sad fact that no matter how good a player is or was, they sometimes get forgotten in baseball history. Flashier, louder and more savvy players come along and steal the spotlight while these great players just go about their business playing the game. This also extends to other arenas like the Hall of Fame, because some players get forgotten by the voters in Cooperstown as well. Baseball publishing is another area where so many of the stories that should be told, if for no other reason than preservation of the game’s history, usually are not. Ken Boyer is one of those players that had an incredible career, but truly never got any of the written credit he deserved. Boyer recently shared a book about himself and his siblings and a few books aimed at the juvenile set were published during his career, but up until now he has never gotten the book he really deserved. Kevin McCann has published the book that baseball fans have been wanting and waiting for about Ken Boyer. Ken Boyer was a staple of St. Louis Cardinals baseball for a long time. Receiver of numerous accolades during his career, he was the type of baseball player parents were glad that their kids looked up to. For some reason throughout time, Boyer never got the recognition he deserved form historians. Perhaps it was his low key demeanor and how he went about his business or some other unknown reason, but it really is a shame the world has not recognized his talents. Kevin McCann has produced a real gem with this book. He takes a look at Boyer’s early life and how his early life struggles helped forge the strong personality that his was. He also takes a look at Boyer’s climb up the baseball ladder. Experiences in the Minor Leagues all added to the personality that eventually shone through in St. Louis. McCann also takes the reader on a journey along with Ken Boyer through his impressive time manning Third Base for the Cardinals. World Series triumphs, All-Star Games and an MVP award just to keep it interesting were all bestowed upon Boyer while manning the hot corner. Next he takes you through the winding down portion of his career with stops with the Mets, White Sox and Dodgers. But the journey doesn’t stop there with Boyer. The author shows us the steps Boyer took to remain in baseball. By starting at the bottom and working his way back up again, he was able to take over the managerial reigns of the Cardinals for a while with limited success before his untimely death in 1982. Finally McCann makes a solid case for Boyer’s inclusion in the Baseball Hall of Fame. Honestly if you can make a solid case to have Ron Santo in the Hall at this point then Ken Boyer is a no-brainer for induction. For some reason baseball has overlooked Boyer’s career and has shown to some degree the flaws with the Hall of Fame voting system. McCann has written a great book with this one. The writing style flows smoothly, moves fast and makes the reader feel like they were actually there. It is a great story that I for one am glad is finally being told on the level it deserves. The book is very hard to put down once you get started. Baseball fans should check this one regardless of team allegiance. It is a player that should be given the historical respect he deserves and hopefully this book takes an important step forward in gaining recognition for the legacy Ken Boyer left behind. With this week’s Hall of Fame vote finally announced, you get to see how many truly amazing players that played the game. Every year we fight about the superstars and who deserves to be enshrined this year. Beyond these greats are the people who are the backbone of the game. The good and borderline great players who are not Hall worthy but still had really good careers. There are also the people who had solid days on the field but were honestly nothing memorable otherwise. For every Hall of Fame caliber player there are hundreds of other players that fell below them in the grand scheme of the game. It is important that history does not forget these types of players. Through their hard work and dedication they have helped forge the story of baseball. Today’s book takes a look at one of those players that had a good career, that while not Hall worthy, still was good enough to be respected and admired by various generations. I went into this book only familiar with Swish Nicholson’s time with the Philadelphia Phillies. A member of the beloved Whiz Kids, he was a name that Phillies fans were accustomed to hearing as one of the Philly greats. It turns out before Bill ever stopped in my hometown, he had a really incredible career in the Windy City with the Cubs, but was hindered by the fact that his prime was during the height of World War II. Being a wartime slugger discounted his achievements on the field because the rest of the world felt all the best players were off serving in the military. This fact created the perception of Swish Nicholson’s career as not being as good as his numbers portrayed, because the competition was not up to its normal MLB standard. This book makes a very solid attempt at showing Nicholson’s career in the correct light it deserves. It gives a lot of background on his personal life and growing up in the early 20th century. The book gives the reader a real feel of what Bill Nicholson was like off the field, as well as what kind of exceptional player he was on it. This book also shows life after baseball and with older players, I find it interesting to see their transition back into regular life. It is so different than what modern players have to go through. It has to be very hard to go from being a star on the field to a regular guy working 9 to 5 and punching a clock. Book like this are important in that they keep the memories of players whom may not have been Hall of Fame worthy alive in the minds of baseball fans. Books like this bring the past back to life and show readers various eras of the game they have only heard of through stories of older generations. Fans should check out Swish Nicholson, it is one of those books that is both entertaining and educational for everyone. Much to most of baseballs surprise, it is the first week of September and the New York Mets have a tight grip on first place in the National League East. Mets fans will understand if the rest of the world says talk to us in a month when all the dust has settled and see where you are. Baseball is a game that you never count your chickens before they hatch. The Mets have been down this road during their history and it has not always been the best of outcomes for them. Now there is a book that helps Mets fans relive the highs, lows and spectacular events that make them proud to be called fans of the Metropolitans. Some years it is harder to be a fan of the Mets than it is in others. From collapses, bad free agent signings, financial scandals and that pesky Bobby Bonilla contract that they are paying on until sometime during the 26th century, it can be tough to be faithful. Mets fans have proven their loyalty to their team and are being rewarded handsomely for it this year. Their team history has not always been the greatest either, from their inaugural 120-loss season to a few World Championships in-between, they still have a rich history that is worth celebrating. John Snyder has written a fun book for New York Mets fans. It covers the entire team history from 1962 through 2010. It covers every facet of the team you could imagine, and breaks each year into segments. Team rosters, statistical leaders, final standings, attendance and a nice little one sentence synopsis that sums up the teams entire season. Next it presents in chronological order any of the important things that happened on or off the field that year that pertained to the Mets. Finally at the end of each chapter it relays an anecdote that pertains to that individual season. If you are trying to brush up on your team history, this book is really a fun way to approach it. Mets fans obviously will enjoy this book. You can re-live memories or even learn about some years you may have been on sabbatical from your favorite team. Yes, that last sentence happens to most fans at one point or another. 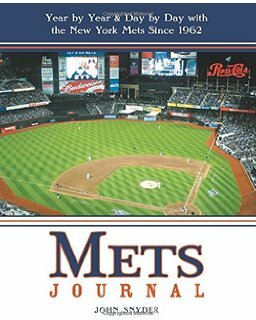 Fans of other teams who are not crazy about the Mets could use this book as a learning tool to gain some insight on team history. Also the author has published other team journals of this type, so your team may be represented by one of those volumes. Lets face it. The New York Yankees have always been the prettiest girl at the dance, the prom queen and grandma’s favorite at Thanksgiving dinner. They get all the ink in the press, they get all the big impact free agents, and have a seemingly endless supply of money. These reasons above have given fans plenty of reasons to hate the Bronx Bombers. In the course of winning 27 World Championships the Yankees have had the occasion to create more than one dynasty in New York. Today’s book takes at the most recent dynasty assembled in the Big Apple, down to its very core. The last thing I want to do when I find time to read a book, is partake in the Yankees propaganda machine. After the 2014 grand retirement extravaganza that was Derek Jeter, I as a fan was tired. I more wanted to find a book that would make me enjoy the good old days of the recent Yankees without finding out why Derek Jeter was the best player ever. Even though Jeter is part of today’s book, it thankfully wasn’t dominated by Derek. Core Four takes a look at the roads traveled by the four main players that were members of the Yankees new millennium dynasty. While that dynasty actually started in 1996, it carried over into the 21st century, so I figured that was the easiest way to categorize it. 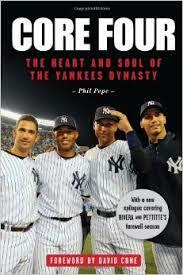 The book looks at Jorge Posada, Andy Pettitte, Mariano Rivera and of course Derek Jeter. It shows the journey each of them made in their private lives to get to professional baseball, their minor league journeys, as well as their pecking orders in the Yankees minor league system. Finally our core four move to the majors and you review each of their individual accomplishments. The part of the book I found most interesting was the way that these four players were present for a substantial period of success in Yankees history. Six pennants and four World Series over the course of eight seasons while these four called each other teammates. That in itself is nothing to sneeze at. But you also see how as some of these pieces moved on to other teams how the Yankees suffered. It is a really interesting look at how the foundation of that dynasty was assembled and how it functioned. Some people enjoy Phil Pepe’s writings, and I am one of them. He is obviously New York biased which is fine if you accept that fact before you start reading the book. This is another stellar effort on his part in the telling of the Yankees dynasty and New York fans should really enjoy it.